Most of the Romantic Suspense I’ve read through the years (and written, as well) features couples where at least one of the pair is directly involved in the investigation. Either the hero or the heroine will be in law enforcement, and sometimes they both are. At the very least, if they aren’t in law enforcement, they’re a directly targeted victim of whoever the bad guy is. When you have that setup, it’s easy to integrate the investigation into the book seamlessly. But what happens when neither your hero nor your heroine has a badge? And they’re not a direct victim of the crime that’s being investigated? If you’re a Romantic Suspense writer who--just for kicks and giggles, let’s say--gets halfway through a book and then realizes this? I’m betting you freak out. No, I wouldn’t know anyone like that. Of course not… Yeah, I do. It’s me. Oops. When it dawned on me that I’d backed myself into this particular corner with my latest book, “Deception in the Shadows,” my first panicked action was to contact three friends who are editors and writers. I asked them all the same question--how do I tell the story of the suspense without putting my hero back in uniform? He’d finally realized this lifelong dream of studying to become a teacher and had left the sheriff’s department for college, and I was going to have to put him back behind the badge? No… I couldn’t. And I couldn’t change the story midstream. Carrie Greer, our heroine, had such a compelling tale that I didn’t have the heart to not tell it the way it deserved to be told. The suspense in the book centers around the murder of her uncle and former guardian, Ron. As the investigation unfolds, Carrie gets one shock after another, and before long, almost everything she thought about herself and the people around her is called into question. She had to get a chance to share her story with the world. So where did that leave the book? As a former LEO (law enforcement officer), hero Robbie Bailey still has a lot of friends in the sheriff’s department. And Carrie’s a dispatcher. So they were surrounded by LEOs but they weren’t going to have the kind of access they needed for me to make the storyline plausible from a law-enforcement perspective. What to do, what to do? After my friends talked me off the ledge, I settled on adding another point of view to the story, that of one of the detectives working the investigation. I’m of the mindset that it takes a village to tell a story, so I’m not opposed to having more than just the hero and heroine’s points of view in a book, but at the same time, I didn’t want everyone we encountered to have their own scenes. I wanted to keep the story as tight as I could. Thankfully, I didn’t have to introduce a new character to make this work. As “Deception” is the sixth book in the series, and all the books feature the same cast with revolving heroes and heroines, we’ve met pretty much everyone before. And by adding in Jason Hudson’s POV, I was able to lay the groundwork for the next two books quite nicely. It was a challenge to balance the investigation with the budding romance, I won’t lie. Not that homicide investigations are romance-filled opportunities, but at least in the previous books we got to see the heroes’ and heroines’ feelings and relationships build more natively. In the end, readers will decide if I pulled the book off well or not, but I enjoyed the challenge after that initial panic. There’s still a good balance of suspense to go along with the romance, and neither overwhelms the other. In this case, going off-script worked. And now that I’m aware of the subtleties of this particular mix, one of the books I’ve been musing about for some time might just get to see the light of day. But that’s down the road a ways, and we’ll see. When all the lies that have been hidden come to light, nothing will be the same. From the time she came to live with her Uncle Ron after the tragic deaths of her parents when she was a young girl, Carrie Greer never had reason to doubt she was wanted. Now a dispatcher with the county, she's a grown woman building a life of her own. But after a trip to Florida, her uncle's attitude changes... and not for the better. While struggling to come to terms with this shift in their relationship and all the collateral damage it causes, another tragedy strikes. Ron Smith is murdered. And the only person with an obvious reason to want him dead... is Carrie. Robbie Bailey is finally free to pursue his lifelong dream of becoming a teacher. But instead of attending classes, he ends up having to return to Leroy and to Carrie, the girl he's been in love with since he was a teenager. He finds himself in the position of having to convince her of the depth of his feelings while protecting her from a vengeful killer bent on keeping long-buried secrets hidden. And he isn't sure he can succeed at either task. 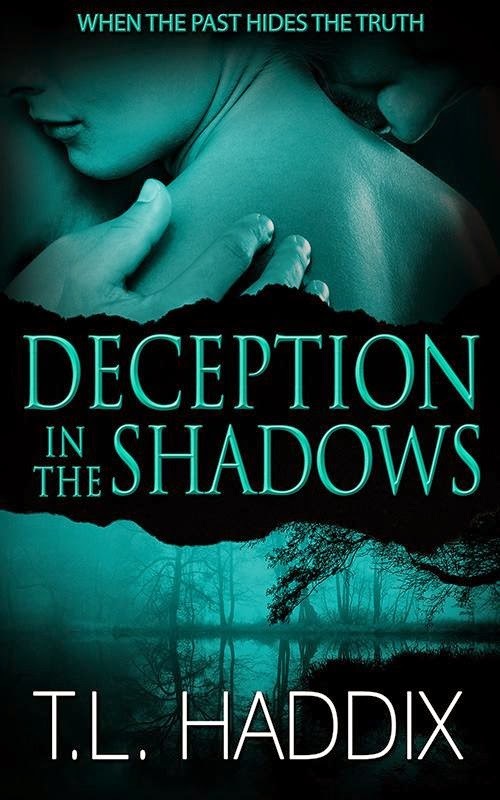 "Deception in the Shadows" is a romantic suspense novel, the sixth in the Shadows Collection Series. Other titles include "Secrets in the Shadows," "Under the Moon's Shadow," "Shadows from the Grave," "Hidden in the Shadows," and "In the Heart's Shadow." I just wanted to stop by and say thanks for letting me bend some ears this weekend. I appreciate the opportunity, and hope to do it again sometime. :) Thank you! T. L.